The Beauty and Personality Company markets the infamous Frownies Facial Pads, used by countless women as well as Hollywood celebrities, to keep their skin looking young and beautiful. Beauty & Personality CEO and health and wellness educator Kathy Wright took some time from her active lifestyle to share more about the company, its products, and some expert tips on anti-aging. LoveToKnow (LTK): Kathy, tell us about your background. How did you become the CEO of B&P (Beauty and Personality)? Kathy Wright (KW): When actress and female example of ageless beauty, Renee Russo made it public in Good Housekeeping Magazine that she uses Frownies to correct and hide what she called a crater between her eyes the buzz about the product demanded a response form the family and I jumped in. The public wanted to know more. My mother-in-law, then seventy seven years young, was asking for help running the small cottage business she had single-handedly keep alive for over 60 years. I thought seventy seven was a fair age to step away from the grind of business, and my husband and I took the helm. My husband is in the business accounting so he does the numbers and I took on the public awareness, marketing, sales, and organization of the B&P Company. LTK: What is the most challenging aspect of your career? KW: I am a people person and love to teach women about wellness, the business takes me from that more than I like. LTK: The signature B&P product, Frownies Facial Pads, don't use any chemicals. How exactly do they work to improve and help reduce the signs of aging? KW: Frownies Facial Patches work just like "Yoga for Your Face." The patches hold a relaxed natural posture on the facial muscles at night while you sleep training the muscles to relax. Just like with yoga a posture is held to reshape the muscles of the body. The muscles of the face take the shape of the expressions we use and Frownies reverse the damaging expression lines mechanically while you sleep. LTK: How often do Frownies need to be used in order to be effective? KW: Results can be seen the first night but lasting results take longer. It depends how much damage has been done to the muscles but even the deepest lines can be relaxed in two to four weeks of consistent use and then a maintenance plan of three to seven days a month will usually keep the lines away. LTK: Despite the success and voluntary celebrity endorsements of Frownies products, the prices for the facial pads are surprisingly affordable. How can you afford to keep them at such a competitive price (around $20 for a box of 144)? KW: We are committed to making Frownies Patches available to every woman. We will keep an affordable price so as to help all women. LTK: In addition to the Frownies Facial Pads, B&P also sells other products, including Rosewater Hydrating Spray, Immune Perfect, Immune Shield, and pH-Balancing Complexion Wash. Is it necessary to use these products in conjunction? KW: Frownies patches will train the underlying muscles with or without other treatments. But, the healthier the skin and underlying tissues the better you look. Rose Water Hydrating Spray is the perfect activator toner to use on clean skin and to activate the adhesive side of the patch. PH Balance is a critical issue for all skin types and cleansing with Frownies pH Balancing wash helps promote skin wellness. Immune Perfect has shown advanced healing abilities in clinical studies due to the deep penetrating carrier which actually delivers active antioxidants to the cellular levels of the skin. Having antioxidants is not delivering them active, there is a big difference. 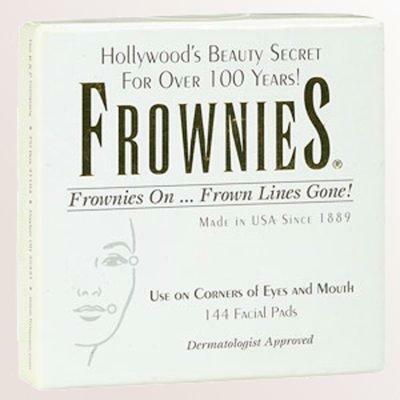 Frownies Products promote long term wellness of the skin and a younger looking skin. Used individually or together as a complete skin care system you can see visible signs of improvement. LTK: What makes these products so effective? KW: The effectiveness of any product is in the ability to deliver active ingredients to a deep cellular level. Biologically active ingredients are very unstable and the carrier is critical. Our products are patented, proprietary formulations. No other company has the whole form ingredients or the active delivery system. We are not marketing hope in a bottle we are delivering healthier skin cells and therefore more beautiful skin. LTK: Are there any other products in the works for potential distribution? KW: We will have to wait and see about that one. There are many things that women can do to prevent and treat the signs of aging. Kathy gives some advice on keeping skin looking young and healthy. LTK: At what age do you recommend women begin using anti-aging products? KW: I believe good sun block is anti-aging, and it should begin very early when there is sun exposure during peek times of day. We all need to cleanse, hydrate, protect, and provide antioxidants as soon as possible, as early as 9 years old girls are wearing color make-up and if they are doing that they are prematurely aging their skin. LTK: How important do you feel diet and nutrition is to healthy skin? KW: I think diet and nutrition are the first things we should be addressing. Unfortunately most women have been taught to look for a quick fix or a magic bullet to give them the beauty of discipline and good health. I am very interested in education and empowering women to take back their health and their beauty. LTK: As a health and wellness teacher and advocate for over twenty five years, what would you say the biggest cause of aging is in society today? KW: Hydrogenated fats and sugary foods are by far the biggest cause of premature aging. The diet is the most controllable and impact full issue here and most women do not know it. KW: What other skin care concerns would you say are most prevalent among women? Dry dull appearance to the skin begins at very young age due to lack of quality nutrition and chemicals in cheep skin care products and oxidation caused by color make-up pigments. For more about Kathy and Frownies Facial Pads, you can visit the company website at Frownies.com. Frownies are sold at many natural health stores, spas, cosmetics stores, gift stores, and more. Find your closest Frownies retailer at by using the Frownies Frownies store locator. You can also buy Frownies products online at Drugstore.com, Amazon.com, and other reputable online health and beauty retailers.